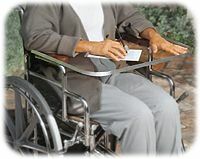 Wheelchair trays have many benefits whether one is confined to a wheelchair regularly or must use one from time to time. These trays make reading, writing and eating so much easier especially there are no portable tray tables around. There are many different styles and price ranges of trays, and the type selected depends on the needs of the user. Removable wheelchair lap trays fit across the entire lap and come in many different materials and styles. Some have hook and loop straps and others have clamps or slide mounts which hold the tray securely onto the wheelchair but also make removal of the tray easy and convenient. These trays are either made of some type of hardwood or padded with a foam and vinyl cover. There are trays which go straight across the lap and others that are cut in a semicircle or half moon shape in order to bring the tray up close to the user, at the same time allowing for maximum comfort. Some of these have rims to keep items from slipping off the tray. Depending on the features and sturdiness of the tray, prices can range from $25 up to around $100. Universal Wheelchair Trays – Large surface area for reading, writing and eating. Hook and loop straps keep this wheelchair tray in place and also makes it universal to fit most wheelchairs arms. Padded half lap boards are generally designed to simply be a comfortable arm rest and work well for holding a book or possibly a drink when you don’t have other wheelchair accessories. These trays can come in a comfortable padded style and some have a convenient cup holder built right into the tray. They are permanently attached to the wheelchair but can flip up and out for easy access in and out of the wheelchair. They are available for the left or right side and cost from $100-$200. 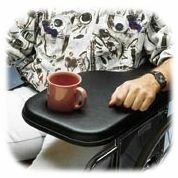 Padded Half Lap Boards – These padded half lap wheelchair boards are great as armrests and trays. When you need it out of the way, simply flip it up. There is also a built in cup or drink holder. Probably the best of both worlds are the flip away wheelchair armrest trays, which are generally a little larger than the padded half lap board. These also allow one to get in and out of the wheelchair without having the inconvenience of removing the tray. The trays can be made out of durable clear polycarbonate, which is a barely noticeable attachment to the wheelchair. The clear strong plastic allows caregivers and wheelchair individuals to see their laps and legs. These trays normally run $100 and up. 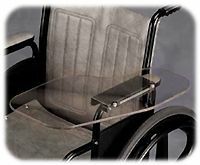 Clear Flip Away Wheelchair Side Trays – Scratch resistant clear polycarbonate wheelchair side trays. The trays are clear so you can see your lap and legs. Large Clear Wheelchair Work Trays – Large and clear tray work surface for your wheelchair. Great as a writing desk or food tray. Although efforts are constantly being made to offer greater convenience to wheelchair users in public, there are times when tables are not always easily accessible. This is what makes a wheelchair tray a good solution to this problem, particularly a flip-away type. Whether one wants to sit and read while enjoying a cup of coffee, or simply needs to sign something or write a check, the benefits of these trays for use in the home and away from home are many. The wide selection can be conveniently viewed and purchased on the web.